There are an endless number of card games out there, but most of those that can be considered fun are intended for younger audiences. Adults are not out of luck, though. There are a variety of fun card games that adults can play, because they offer fast-paced action, competition or other characteristics that make them enjoyable for all ages. Contract bridge is a game that requires strategy, memory, communication and probability in order to play. It is a trick-taking card game that involves a 52-card deck and four players. Four players create two partnerships, which sit across from one another at a table. There are two rounds, the bidding or auction round and the play round. After the two rounds, the hand is then scored. The bidding portion of the round ends in a contract. This involves one partnership declaring that they will take a specific number of tricks. One of the player's hands is displayed on the table face up, serving as a dummy. Gin rummy is also known as knock poker, gin, poker gin and gin poker. This is a matching game that involves two players and a 52-card deck. Gin is an evolution of whiskey poker, and evolved as a faster form of standard rummy. The object of the game is to score a higher number of points than the opposing player. Melds offer higher point amounts, such as sets of the same cards in threes or fours or runs of at least three cards in a same suit. Players try to eliminate deadwood, which are cards that do not fit into a meld. Players draw and discard a card with each round, alternating turns until the stock pile has only two cards left. Poker is actually a family of different card games sharing similar betting rules and hand rankings. The most popular type of poker in the United States is Texas Hold 'Em poker, though there are a number of variations. Players take turns in a clockwise fashion, placing bets or folding. Some versions of poker deal only two cards to each player, with five cards being dealt on the table as the flop, turn and river; these cards can be played by any player in combination with the cards in their "pocket." 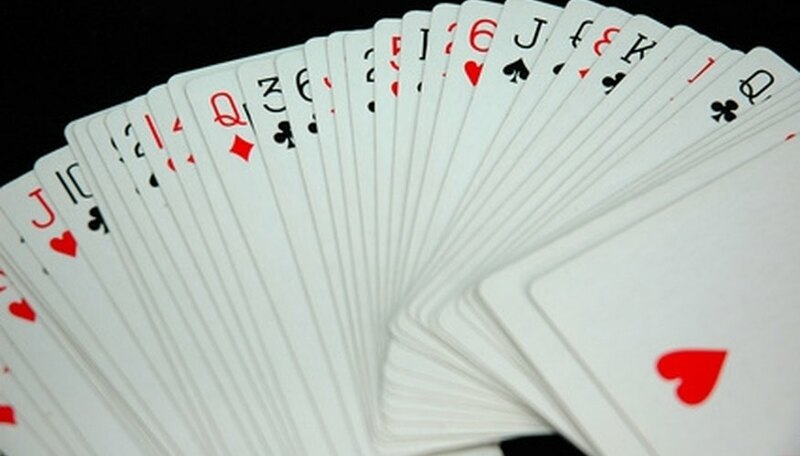 In other versions of poker, each player is dealt five of their own cards and they are given one chance to discard and replace cards to form a hand. You can play poker with as few as two players and a dealer, or as many players as your table will reasonably support. "Hoyle's Modern Encyclopedia of Card Games"; Walter Gibson; 2001.